Weller WXA2 2 Channel Power Unit is for operation with external compressed air and is ESD-safe. The WXA2 features equipotential balance, intelligent tool detection, and unit data traceability aswell as a USB interface. In the WXA2, the amount of air can be controlled using the rotary knob. The Weller WXA2 2 Channel Power Unit has 3 separate operating modes, Operating mode level 1 the air flow continues for as long as the button on the hot-air iron or foot switch is pressed. Operating mode level 2 if the button is pressed once, the hot-air flow continues for between 0 and 300 seconds, stopping at the end of the set time. Operating mode level 3 the WXHAP 200 switches on with one press of the button and off with the second press. The WR3M Power Unit is one of thousands of quality tooling products available from MRO Tools. 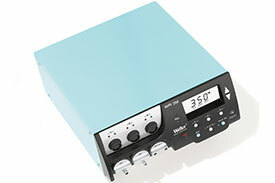 Please browse Weller Solid Stations Technology Line for tools similar to the WR3M Power Unit. WR3M Power Unit description summary: Weller WR3M Power Unit. Dimensions: 11.02'' x 9.45'' x 4.06'' Voltage: 230V Heating Output: 360W Temperature Range: 150F - 999F(50C-550C) Temperature Accuracy: 17F(9C) Temperature Stability: 4F(2C) Max. Vacuum: 0.7bar Quantity discounts may be available for the WR3M Power Unit. Please contact MRO Tools for details.